Islington Council’s Community Chest Celebration was filled with entertainment on Wednesday, with countless stalls and entertainment including music and line dancing at the North London borough’s Assemly Hall. 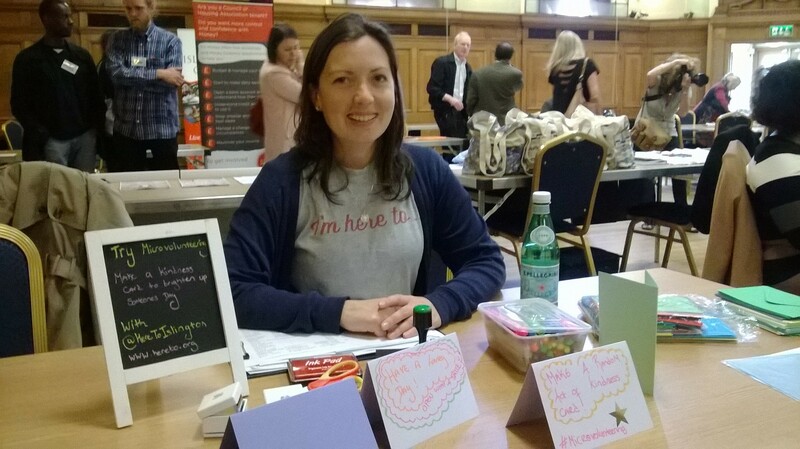 Here to Islington’s volunteering table, which was run by community development co-ordinator, Joanna Bevan, were producing feel-good cards to hand out to people in the festival. The community spirit was lifted in Islington Assemly Hall by the Baluji Music Foundation who graced the stage with the enchanting harmonies of the Inner Vision Trio. The band, whose primary aim is “to bring together blind musicians and make music from around the world”, consisted of singer, Fereshteh Khousroujerdy who hails from Iran, singer and oud player, Ziad Sinno from Lebanon and South Indian drummer, Ghow Ratnarajah from Sri Lanka. The crowd joined in with claps aplenty when the band played the popular Arabic song, دقي يا ربابه, of which the catchy chorus is ‘Diggy Diggy Ya Rababa’. The Packington Line Dancers, who have been keeping Islington locals fit for almost 18 years, entertained the hardworking volunteers and reignited the feeling of true community spirit. Islington youth group, Amberliegh, performed traditional African dance in colourful dress and to enthusiastic spectators. The cultural drumming, drama and dance music group for children of all abilities and disabilities followed the earlier acts, reflecting the diversity of Islington and its community. Other community groups included the Handmade Alliance which helps to rehabilitate prisoners through textile production and the Federation of Iraqi Refugees. Tags: community, here to islington, journalism, volunteering. Bookmark the permalink.